I love decorating my garden with funky art pieces - especially when they are kid made! When a palette of Glamour Dust paint landed on my porch along with a bag of rocks, I knew we'd be in for a fun, kid-friendly art date! 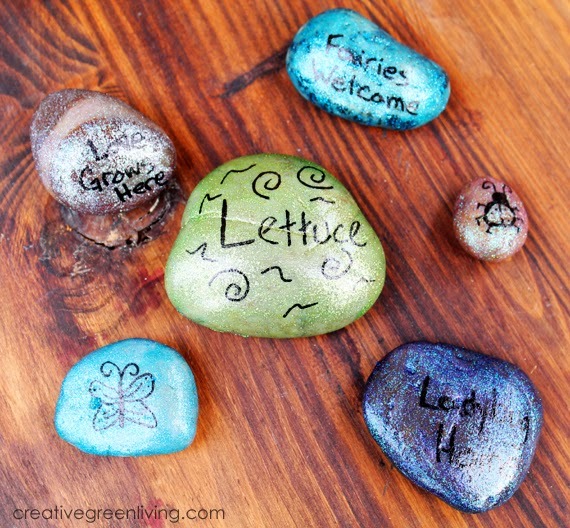 Turn your rocks into plant markers, doodle on them and scatter them about or just make a collection of sparkly rocks to brighten things up. 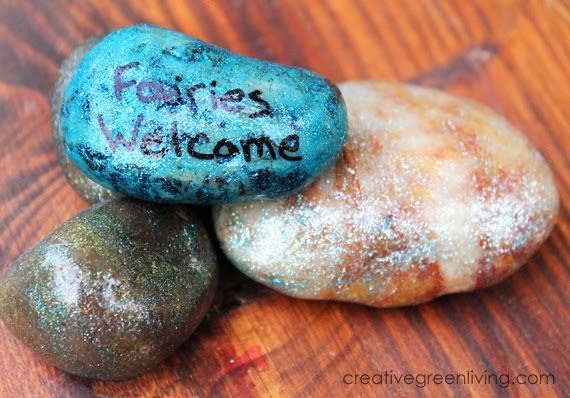 Once the glitter paint is dry, you can use permanent markers to decorate the rocks. I added a few fun designs like ladybugs and butterflies. I also turned one into a garden marker for lettuce and wrote fun messages on the others. 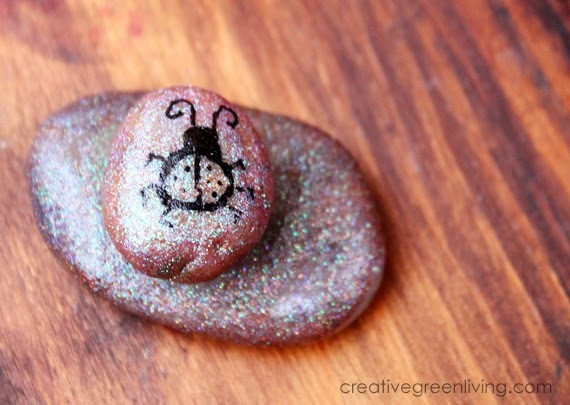 Except for one of his rocks, K preferred to leave them plain and sparkly. 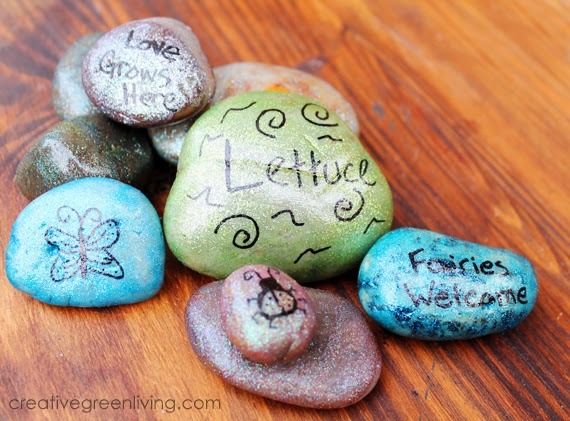 If you are planning to leave your rocks outside in the weather, seal them with Martha Stewart Decoupage medium. 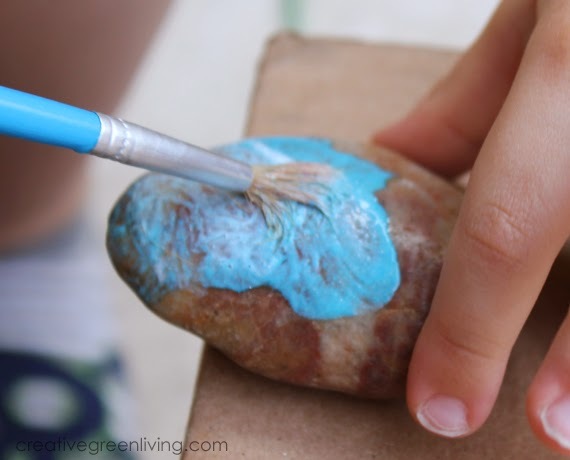 I used the glitter formula because it is not only sparkly but it is weather proof (unlike the glitter Mod Podge) and will keep your rocks looking great for a long time. Apply at least two coats, waiting for the first coat to dry completely before adding the second. FTC Project Materials Disclosure: In compliance with the FTC guidelines for bloggers, I am letting you know that I did not purchase the materials for this craft project myself. The rocks and Glamour Dust paint were sent to me by Mrs. Meyers Clean Day as part of a promotion with no obligation to use or write about the products. I only ever write about products that I like and actually use - and think you will, too!